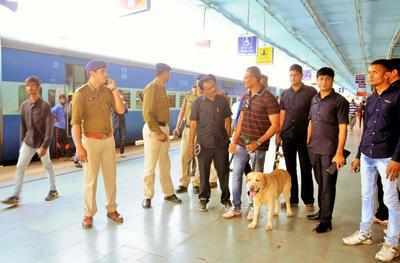 Vadodara: A day after a live bomb was found and defused in Rajkot, the bomb disposal squad of government railway police conducted search at Vadodara railway station on Wednesday. The police said that the members of bomb disposal squad conducted random search operations on all seven platforms of the railway station. Cops used metal detectors and a sniffer dog to search for suspicious items at the railway station. “The bomb disposal squad conducts random checking regularly but after a live bomb was found in Rajkot on Tuesday, random search operation was conducted to avoid any untoward incident,” said GRP police inspector B J Baria. A live bomb, that could have claimed several lives, was defused in densely populated Khodiyarnagar area on 150 feet Ring Road in Rajkot on Tuesday. The police had found two gelatine sticks in one box and around 3kg explosives in another. The gelatine sticks were attached to the timer with wires, a 12-volt bike battery and detonator.